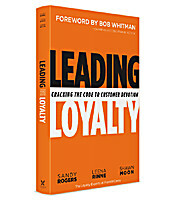 In Leading Loyalty, co-authors Sandy Rogers, Leena Rinne and Shawn Moon have identified the key differentiators of loyalty-leading organizations. Leading Loyalty helps you infuse the principles of empathy, responsibility, and generosity into every employee and customer interaction, and reveals the practices of everyday service heroes - the customer-facing employees who cultivate bonds and lift revenues through the roof. It’s time to invest in building loyalty. Leading Loyalty will show you the way. The three key traits of the Loyalty Leader Mindset. How to genuinely connect with customers and colleagues. The true meaning of being responsible to your customers and employees. To infuse your organization with generosity that surprises and delights.